Aqua Whitening Cream Sunburn Relieve And Moisturizing Cream. Good day everyone. Welcome November. Wishing you a happy and blessed month. Hopefully this month will bring more happiness to us despite the uncertain weather changes, with hot and humid climate throughout the year. After all, I am grateful (we should), since we still have family and friends to talk to, a place to stay, food to eat. Opps, too much for the intro yeah? Haha. For the past two months, it was a pretty busy months for me since I have so much works outside the area. Being a personal assistant is pretty challenging job! Too much sun exposed and outdoor activities make my skin loss in moisture and tend to be more drying than usual. A slightly visible sunburn marks also appear. Lack of sun protection, not enough water consuming, insufficient skin hydration and moisturized could be some of the contributing reason. Dry, moisture loss and dehydrated skin lead to cracking and peeling skin, fine lines and wrinkle will be more noticeable and making my face look dull and ageing. Wearing a makeup on this kind of skin also become difficult for me. With the problem arise, I got myself a moisturizing cream, Aqua Whitening Cream from Hansaegee Nature to give it a try. It is Original made in Korea! Yayy. 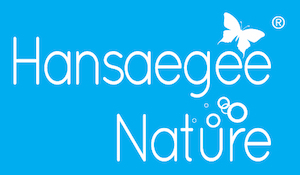 Aqua Whitening Cream from Hansaegee Nature is a moisturizing and whitening cream. It helps to repair sunburn and damaged skin and penetrates deep onto skin to keep skin moisturized. Aqua Whitening Cream is an awesome cream for me because it is formulated with many herbal extract to give maximum benefit to the skin. The main ingredients includes Camellia Japonica Seed Oil and Niacinamide. Camellia flower are native to Japan and North China and widely known, Camellia Japonica Seed Oil has many beauty benefits, rich in antioxidant and nutrients that are great for skin and hair. Some of the key nutrients include Vitamin A, B, E, Palmitic acid, Linoleic acid, Omega fatty acid and more. They are a great moisturizing agent, keep moisturizer deep into lower layer skin, has strong anti inflammatory properties that are good to reduce redness, repair sunburn and it contains antioxidants which reduces acne inflammation and of course antioxidant are top anti-aging ingredients! Camelia oil also has an SPF of 3-5 (source), so thank to Aqua Whitening Cream, it would be awesome if we apply some Camelia Oil before our daily sunblock right. Aqua Whitening Cream also contain Niacinamide, another popular ingredient that are widely used in skincare product nowadays. Niacinamide also known as Nicotinamide (NAM), is a form of vitamin B-3, an essential nutrient, found in food and used as a dietary supplement and medication. What benefits does it offer to skin? To list it down, there are a lot! Niacinamide help skin grow a ceramide (lipid) barrier, which can, in turn, helps retain moisture (source). It is also a great anti-aging ingredient, it helps reduces inflammation, treat acne, treats hyperpigmentation (lighten dark spot), minimizes pore appearance, minimizes fine lines and wrinkles. Niacinamide can helps build cells in the skin while protecting the skin from sunlight making the skin firm and healthy. Water, Cyclopentasiloxane,Glycerin, Niacinamide, Pinus Densiflora leaf extract, Sodium chloride, Angelica acutiloba root extract, Cnidium officinale root extract, Paeonia albiflora root extract, Rehmannia chinensis root extract, Prunus armeniaca (Apricot) kemel oil, Camellia Japonica Seed Oil, Betaine, Cetyl PEG/PPG-10/1 Dimethicone, DMDM Hydantion, Perfume, Gardenia florida fruit extract. 1. After cleansing, apply an appropriate amount onto face and neck, water drops form will appear on the skin within seconds. 2. Pat the skin, gently smooth until the moisturizer fully absorbed into the skin. When skin feel dry than usual, take a small amount and wear it thinly. 50g Aqua Whitening Cream comes in a nice jar with two cover, the second cover for hygiene purpose. No scent detected. What I love about this cream is the texture. I am so in love! It has a unique water drops based cream. The cream is in milky gel type. After spread cream evenly over skin surface and massage gently, the cream turns into water drops! How wonderful. After patting gently, the cream fully absorb. Pretty fast absorb into skin. At first, it feel a little bit tacky after applying the cream but it slowly fades away. It leave a refreshing effect, no sticky feeling and skin feel moisturize. I did a moisture test on back of my hand-rarely putting lotion on, after applying Aqua Whitening Cream, I can see clearly an obvious difference. Skin moisture and soft improve a lot. Formulated with herbal extract and having Niacinamide as the main ingredients for brightening effect, this cream help me a lot to repair sunburn on my skin. After using for a weeks, I can see an impressive improvement on the sunburn marks. You know, I have a warm undertone, so when my skin burn, it tend to leave a darker/black mark rather than pinkish tone. It really help to fades away the marks! As Niacinamide act as whitening agent, together with awesome herbal extract, it did a great job to improve my skin tone and hydrated my skin. Skin feel sooth, firm and moist. If you wanna repair sunburn, at the same time moisturize you skin, please give Aqua Whitening Cream a try. I love it since it works pretty awesome for me. repair redness and sun burn damaged skin. If you like to try this cream and other product from Hansaegee Nature, head to their website now. Visit their website and social media for more awesome content and information.